Any beer lover visiting Eugene would be remiss not to stop at ColdFire Brewing. Welcome to the road version of Weekend Beer-cap. Yours truly is still up in Oregon for a little while longer, still bouncing around breweries. I am currently down in Eugene, which is one of those towns that most people probably just pass through going between Portland and Bend. Yeah, it is a college town, but ignoring the ubiquitous Ducks merchandise everywhere, it also has a fair number of breweries. Ninkasi is the big boy here, distributing its beers as far away as Arizona. Heck, Ninkasi even sponsors Sunday games for the Eugene Emeralds, the short-season Single-A affiliate of the Chicago Cubs (for those that do not follow baseball, that is four levels below the Isotopes, mostly kids right out of college). Imagine Marble sponsoring Sunday games at Isotopes Park. Oh, we can only dream. Since I had Ninkasi before, outside the ballpark I aimed to visit the smaller breweries. My favorites so far have been ColdFire, Elk Horn, and Falling Sky. They all have a nice mix of stouts, pilsners/kolsches, reds, IPAs, and the rest. Falling Sky also had a pretty solid menu, even if the chefs went way overboard on the pesto on the chicken-and-bacon sandwich. ColdFire is the only one without food, but its American Stout and Stylish Kolsch were worth two visits. Anyway, here is what a couple other Crew members were up to back home while I was away. Why yes, that is a blend of Raspberry and Tangerine Dynamite at Steel Bender. Full disclosure, I am not typically a fan of sours. But, all summer I have been drinking Steel Bender’s Raspberry Dynamite, on purpose! This Sunday we went to Steel Bender to try the next in the Dynamite “series,” Tangerine Dynamite. While still good, to me it is a little more on the sour side than the Raspberry, or it feels that way. The beertender suggested mixing the two and she even poured a sample that way. I fell for it immediately because it looks so neat. I noticed quite a few going out to servers, so I think they struck gold with that. Next time, I will stick to straight Raspberry, but it was a lot of fun. A little 7K IPA goes well with salsa. Unlike many in the DSBC, I suspect, I have a secret second life as a Latin dancer. Yes, it’s not pretty to see in my case, but at least it’s something that can be done while drinking good beer. (It’s practically a requirement, really.) Sunday evening, the New Mexico Salsa Congress held a fundraiser at B2B, the taco/beer joint near Uptown. The place has very good tacos and supposedly 60 NM beers on tap. This is a monthly event, so if this sounds interesting to you, stay tuned for future events! Get your geek-on with the Crew! Anyone else need a vacation after the three-day weekend? Yeah, it was jam-packed with beer events, from the two festivals Sunday to Monday’s Battle of the Beer Geeks II (congrats to the Babes in Brewland on their victory). Now it’s back to a simpler slate of tastings and tappings across town. Today features special events at The Grain Station, El Pinto, Farm & Table, 5 Star Burgers, Bistronomy B2B, and more usual haunts such as Two Fools, Rock & Brews, Tractor Wells Park, and Nob Hill Bar & Grill. What: Lagunitas and Upslope Special Tappings. Where: Nob Hill Bar & Grill. When: 5 p.m. Cost: No cover charge. Details: Once again, bar manager Thomas DeCaro is pulling out all the stops to bring us great beer. Upslope is bringing two new beers to tap here in ABQ in the form of the Yirgacheffe Coffee Dubbel, a coffee-infused Belgian-style beer brewed in collaboration with Dragonfly Coffee Roasters (which is adjacent to one of Upslope’s taprooms in Colorado). That will be paired alongside the Japanese Dry Lager, made with jasmine and Sorachi Ace hops. At the same time, Lagunitas has their IPA, double dry-hopped, on cask. Why you should go: Two brand-new beers to New Mexico, plus a hopped-up version of a hugely popular IPA. Throw in some great NHBG food and you have a good way to spend an otherwise quiet Tuesday evening. NEW EVENT >>> What: Santa Fe Special Tapping. Where: Gecko’s (both locations). When: 11 a.m. Cost: No cover charge. Details: SFBC’s new Session Ale will be tapped at both Gecko’s, NE Heights and Nob Hill. Why you should go: A new beer that’s big on flavor, light on ABV, would pair nicely with Gecko’s food for lunch. 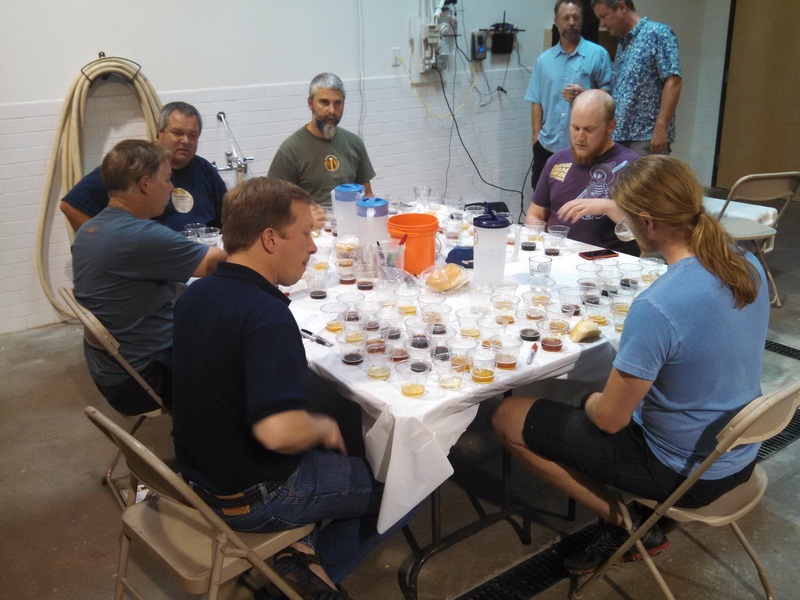 What: Stone Stochasticity Project Tasting. Where: Total Wine (both locations). When: 1 to 3 p.m. (Cottonwood), 4 to 6 p.m. (Uptown). Cost: No cover charge. Details: Free beer samples. Why you should go: Free beer samples. What: Santa Fe Sampling. Where: Total Wine Uptown. When: 2 to 4 p.m. Cost: No cover charge. Details: Free beer samples. Why you should go: Free beer samples. What: Alaskan Sampling. Where: Total Wine Uptown. When: 3 to 5 p.m. Cost: No cover charge. Details: Free beer samples. Why you should go: Free beer samples. What: Tupac Tuesday with Tractor. Where: The Grain Station. When: 3 p.m. Cost: No cover charge. Details: Tractor has brewed up a fresh batch of Tupac Cali Red and is taking it over to The Grain Station, where they will have it on tap to go with their great food. There will be some live art as well. Why you should go: Enjoy a quality beer with some quality food and pull of a two-for-one in terms of supporting local businesses. What: Dogs Drink Free Happy Hour. Where: El Pinto. When: 4:30 to 6:30 p.m. Cost: No cover charge. Details: No, that’s not a typo, your dogs can drink for free on the patio at El Pinto from today through Thursday. They will have Bowser Beer, a special alcohol-free beer made specifically for dogs. As for humans, there will be four Lagunitas beers for you — Cappuccino Stout, Equinox Pale Oat Ale, Brown Shugga’ Barleywine, and the special limited release of Waldo 4/20. Why you should go: Awesome new Lagunitas beers and old favorites, plus a chance to relax with your best friend. Throw in some delicious El Pinto food and it all adds up to a great afternoon. What: Alaskan Tap Takeover and Special Release. Where: Rock & Brews. When: 5 p.m. Cost: No cover charge. Details: Free beer samples. Why you should go: Free beer samples. What: Music for What ALES You. Where: Tractor Wells Park. When: 5 p.m. Cost: No cover charge. Details: Local musician Casey Mraz will provide the tunes, while you can purchase special beer and grilled cheese pairings from the Cheesy Street outside for just $13. Why you should go: Delicious grilled cheese offerings paired with Tractor beers while live music is playing. Sounds like a chill out and relax kind of event, if you ask us. What: Kona, Redhook, and Widmer Brothers Sampling. Where: Total Wine Uptown. When: 5 to 7 p.m. Cost: No cover charge. Details: Free beer samples. Why you should go: Free beer samples. What: Marble and Farm & Table Beer and Food Pairings. Where: Farm & Table. When: 6 p.m. Cost: $50 for six beer tickets and a four-course meal. Details: Farm & Table will host a Spring BBQ event with five different Marble beers on tap — Pilsner, Wildflower Wheat, Oatmeal Stout, Maibock, IPA. There will be stationary appetizer trays of cheeses, chicken wings, and other finger foods. There will also be house-made brats, with baked beans, potato salad, and fresh green salad. There will also be dessert in the form of double chocolate cupcakes with a stout caramel cream (yum). In addition to the food and beer, there will be some games in the courtyard and a live band, Next Three Miles. Why you should go: Food, games, beer, music, it’s like a midweek party that you’ll probably need. Call (505) 503-7123 or email reserve@farmandtable.com for reservations. What: Goose Island Tapping. Where: Two Fools Tavern. When: 6 to 8 p.m. Cost: No cover charge. Details: We are blessed again to have more Goose Island Bourbon County Brand Stout on tap at the tavern. Why you should go: The Bourbon County series is the best thing that Goose Island makes, plus you can chow down on some great food while you enjoy a glass. What: 5 Star Burgers presents an evening with Craft King. Where: 5 Star Burgers Old Town (next door to the Draft Station). When: 6 to 9 p.m. Cost: $20. Details: How about five delicious food items paired with craft beer, plus having Albuquerque’s Craft King (our friend Angelo Orona) on hand to answer all of your beer questions? Sounds like a great way to spend your evening. The food/beer pairings are Potato Chips topped with a gorgonzola drizzle paired with Bosque Lager; Taos Slider paired with Marble Red; Teriyaki Slider paired with Boxing Bear Paw Swipe Pale Ale; BBQ Slider paired with Santa Fe Nut Brown; Sweet Potato served with a Sweet Maple Cream paired with Oskar Blues Old Chub Scotch Ale. Why you should go: Expand your beer knowledge while drinking delicious beers and eating amazing food. What: Beer Bike 5K. Where: Civic Plaza. When: 6:30 to 9 p.m. Cost: $30, with tickets available online here. Details: Hope on board the Duke City Pedaler at Civic Plaza and ride it around to Marble, Tractor Wells Park, and Back Alley Draft House. You get member prices at each location. This even will repeat Wednesday and Thursday. Why you should go: Burn off some beer calories while, um, adding more beer calories! Hey, it’s a win-win, plus it is one of the most fun and unique ways to enjoy a mini-pub crawl. Just be prepared, it’s a little over 3 miles in length and the DCP is tougher to pedal than it looks. You’ll get a good workout plus good beer. What: Burgers and Brews. Where: Bistronomy B2B. When: 7 p.m. Cost: None listed. Details: Enjoy some great burgers and some of B2B’s best beers paired together. If you buy a B2B beer, you get a special Yelp! glass. The B2B brewers will be on hand to talk about their creations. Why you should go: B2B always has great food, plus some really unique and different beers. If you have never gone, head over to Central.